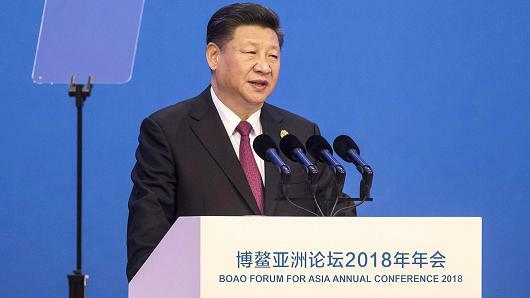 Chinese President Xi Jinping gave the keynote speech at the Boao Forum for Asia in Boao, Hainan province, on Apil 10 and met Chinese and foreign business leaders. Xi ushered in a “new phase of opening up,” making broad commitments to further liberalize China’s economy such as by “significantly broadening” market access, easing restrictions on foreign firms, lowering import tariffs, and creating a more attractive investment environment. He said that China will create a more comfortable and orderly environment for investors from both home and abroad. China is dedicated to building an open world economy to contribute to the development of Asia and the world, Xi said. He added that China will make great efforts to move its economic development from high speed to high quality and stick to its path of deepening reform and opening-up. Through putting forward the Belt and Road Initiative, China aims to share its development with the world and pursue common development, Xi said. Xi also promised a reduction in the current 25% import tariff on cars and a raised foreign investment cap on joint ventures. New energy vehicle (NEV) manufacturers would even be allowed to set up wholly-owned companies in free trade zones (FTZs). Wang Sheng, Analyst with Shenwan Hongyuan Securities, said the President’s remarks represented a substantial step forward in encouraging majority ownership by foreign car brands in China. President Xi Jinping said China would grant foreign companies greater access to the financial service sector and further reduce restrictions on foreign ownership. People’s Bank of China Governor Yi Gang also announced detailed opening-up measures covering the country’s banking, insurance, securities and wealth management sectors. Yi said China would allow foreign investors to take a maximum 51% equity stake in brokerage firms, futures companies and fund management firms and foreign equity ceilings will be totally removed in these sectors within three years. In addition to financial liberalization. China will lift foreign ownership restrictions in the life insurance sector in three years and raise foreign ownership limits from 50% to 51% in joint-venture life insurance firms by the end of June. The market share of foreign life insurers in China stood at around 5.8% by the end of last year, but their market share in large cities such as Beijing, Shanghai and Guangzhou has been close to 20%. Chinese experts also called for further reform of the domestic capital market, including rules for initial public offerings (IPOs), delisting, mergers and acquisitions (M&As), and information disclosure by listed companies. Shanghai and Shenzhen aim to become global financial centers rivaling New York and London. President Xi Jinping said the Belt and Road Initiative (BRI) may be China’s idea, but its opportunities and outcomes are going to benefit the whole world. Xi also said that as a new initiative, it is perfectly natural for there to be different views on cooperation. It is a globally important initiative that represents perhaps the most coherent grand strategy in world affairs at the moment, according to Kent E. Calder, Director of the Reischauer Center for East Asian Studies at Johns Hopkins University, who also attended the Boat Forum. Last year, Chinese enterprises made USD14.36 billion in non-financial direct investment in 59 countries involved in the initiative. David Dollar, Senior Fellow at the John L. Thornton China Center of the Brookings Institution, said the Belt and Road Initiative is a global effort on China’s part to fund infrastructure investment, but he added that currently most projects are undertaken by Chinese companies, so “there are not a lot of business opportunities for U.S. firms”. Jon Taylor, Professor of political science of the University of St. Thomas in Houston, however, said there are tremendous opportunities for U.S. businesses – if they are willing to put in the effort. Some U.S. companies, such as Chubb, General Electric and Caterpillar, all have publicly stated that they see the Belt and Road Initiative as an opportunity for business growth, he added. Gordon Houlden, Director of the China Institute at the University of Alberta, Canada, said the plan is easily the single largest international program of trade and investment in the 21st century. Former United Nations Secretary-General Ban Ki-moon was elected Chairman of the Boao Forum for Asia, replacing Yasuo Fukuda, the former Japanese Prime Minister. Chinese Vice Foreign Minister Li Baodong was appointed BFA Secretary General, while former People’s Bank of China Governor Zhou Xiaochuan was designated as Vice Chairman and China’s Chief Representative to BFA. Of the 19-member BFA board, 12 are newly elected. Founded in 2001, the BFA is a non-governmental and non-profit organization committed to promoting regional economic integration and bringing Asian countries closer to their development goals. World leaders attending the event included Singaporean Prime Minister Lee Hsien-loong, Austrian President Alexander Van der Bellen, Dutch Prime Minister Mark Rutte, Pakistani Prime Minister Shahid Khaqan Abbasi, Philippine President Rodrigo Duterte and Mongolian Prime Minister Ukhnaa Khurelsukh.